A proper and maintained key system is the first defense against loss and liability issues. Whether you are securing a space within a building due to HR or Confidential Client records or securing valuable assets, you should respect your key system with the same security you do of your financial records or credit cards. You wouldn’t give anyone your CC number or not replace it immediately if lost, or worse yet stolen right? The same goes for key systems! The differences between Restricted, Patented, Security and UL437 Drill and Pick resistance. First, let’s address a few keying terms and concepts to become more familiar with terms we’ll use throughout the series. 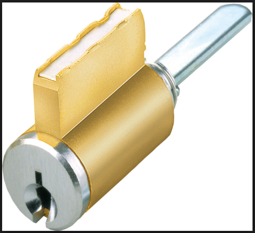 The correct key works a cylinder plug to turn a tailpiece or cam to control a locking mechanism. 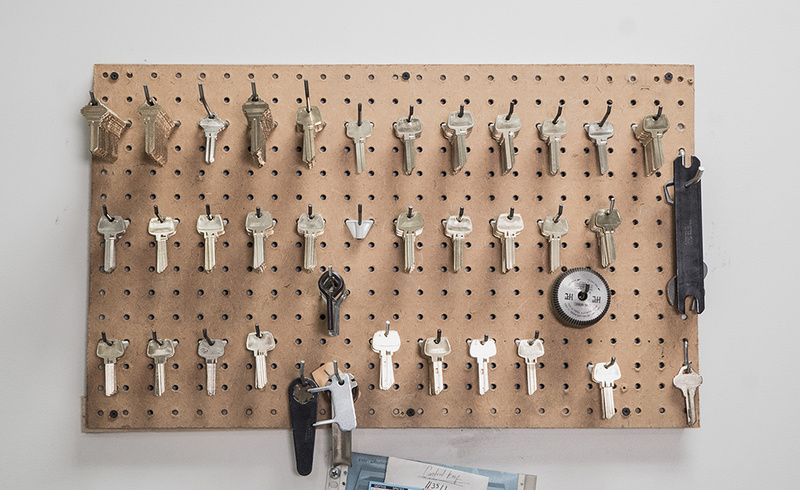 The key is part of a key system — it could be a change key, day key, control key, or master key. The key’s side grooves create the keyway and only works with the cylinder that has the negative/opposite grooves. The key’s peaks and valleys, or unique indentations, coincide with the cylinder’s pins and are referred to as bitting. 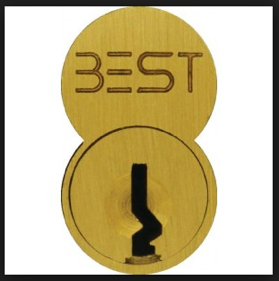 Stamping on the key can vary from a key group number related to the keying system, pinning/bitting information, and will typically indicate the manufacturer and its keyway. You will typically find “Do Not Duplicate” on the key, especially for lower level security keyways that can be copied or compromised from duplication. If you want a key system that is challenging to copy or compromise, you need to request a Restricted, Patented or Security keyway. These specific keys typically have limited distribution and are quite challenging to duplicate. A more secure key system can increase the cost of a key system by 10% to 200%. Although the cost of a typical key of $3.50, this is a minimal cost compared to lost or stolen information or assets that are not recoverable! A cylinder is where all of the magic happens. The cylinder has a core, sometimes referred to as a plug. For commercial cylinders, the core typically has 6 or 7 pin cylindrical chamber. Residential cylinders are typically 5 pin chambers. 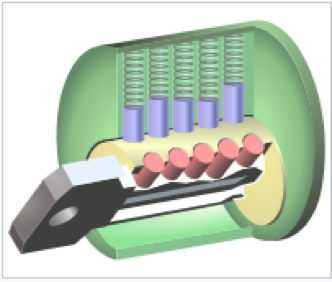 These pin cylindrical chambers hold small pins (wafers) along with springs that are placed with precision and per the bitting records to create shear lines that work with a specific key(s). The combination (peaks & valleys) of the key is commonly referred to as the bitting. It is important to note that the fewer the keys that operate a cylinder, the less shear lines are created, and the better security of your cylinder. A manufacturer’s Conventional Cylinder is part of a cylinder housing and is more challenging to remove for keying — this is also referred to as ‘pinning’ the core. If the cylinder is housed in a lever, the lever must be taken off to be keyed. If the cylinder is housed in mortise lockset or in an exit device, the locking device has to be partially taken apart to access the cylinder for keying. If you plan on rekeying your facility on a routine basis due to high turnover in staffing, or turnover due to housing, such as a dormitory or rental property, you may want to explore the possibility of a Removable Core Cylinders noted below. Both types are distinctly different and commonly misunderstood, so let’s explore further. A Large Format Removable Core is a larger, figure-eight-shaped cylinder core that can be removed from the locking device with a special key called a ‘Control Key’. This makes it easy to take out the core and put it back in after keying, without removing any trim or hardware. The Large Format Removable core is sometimes referred to as the LFIC (Large Format Interchangeable Core) and is specific to the manufacturer. This means it cannot be interchanged with other manufacturers. Therefore, if you have a LFRC or LFIC, it only serves the purpose of convenience for rekeying and is not technically interchangeable. 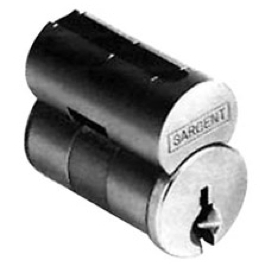 Small Format Interchangeable Core (SFIC) is a small figure-eight-shaped cylinder that can be easily removed from the cylinder housing with a Control Key. The term SFIC means exactly what it states — that it can be interchanged from different manufacturer cylinder housings. This is ideal for large facilities that want to standardize their operations on a single keyway or key system, but also desire multiple manufacturers for locks and exits. The SFIC is more commonly seen in large campus settings and facilities that require rekeying on a recurring basis. The key and cylinder are the base foundation of what goes into a key system. In the next article in this series, we will outline the advantages and disadvantages of Restricted, Patented, Security, and UL437 Drill and Pick resistant cylinders!